Half of Vermont towns will pay higher property tax rate than last year. This chart shows towns with the highest rate in 2019 at the top. Pomfret has the largest increase (shown right); Middletown Springs the largest decrease. Two weeks after lawmakers and the governor resolved a budget impasse centered on a dispute over property taxes, the Department of Taxes published the rates taxpayers will see reflected in their bills this year. 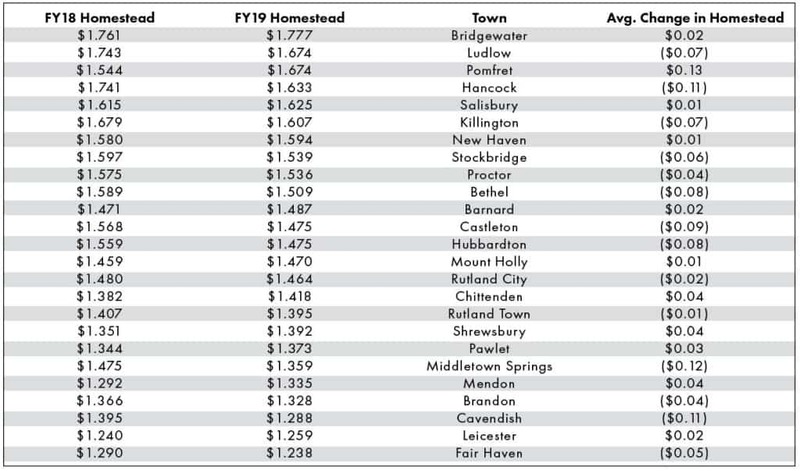 More than half of the towns in Vermont, 135 out of 249, will see higher average homestead property tax rates than last year — even though Gov. Phil Scott was able to harness surplus money to prevent a hike in the average residential property tax. But that’s no surprise. In May, the Legislative Joint Fiscal Office predicted that this would happen. Scott and lawmakers brought down the average statewide rates, but that doesn’t change the fact that some towns voted to spend more on education than others and will see higher rates. While Scott was able to level the average residential property tax rate, he wasn’t able to fully buy down the average nonresidential property tax rate: a levy paid on property like small businesses, rental homes and summer camps. That rate was set at $1.58 — a 4.5 cent hike over last year. Because of this, the vast majority of towns — 222 out of 249 to be exact — will pay higher nonresidential tax rates than they did in fiscal year 2018. In general, the rates trend slightly higher than the ones set in the budget and tax bill Scott agreed to allow to become law last month because of increasing statewide property tax values, according to Kaj Samsom, commissioner of the Department of Taxes. Changing property values are factored into property taxes each year through the common level of appraisal, or CLA, adjustment that’s applied to rates. Every year the tax department conducts a study to determine how much the market value of the property in that town differs from their last assessment of the town’s cumulative property value (or grand list). The CLA adjustment accounts for the difference between the two figures—municipalities with increasing market values typically see a bump, and those with decreasing values see a slight break, in property tax rates. “Statewide there will be an upward pressure on average tax rates just because of market value growth not reflected in grand lists,” Samsom said of the fiscal year 2019 rates. Douglas Farnham, Tax Department economist and director of policy, said much of Vermont is seeing rising property values. But he noted that this isn’t the case across the board.